Whatever your Game Plan, it should probably include this delicious and hearty yet lean chili. Courtesy of Best Recipes Ever. 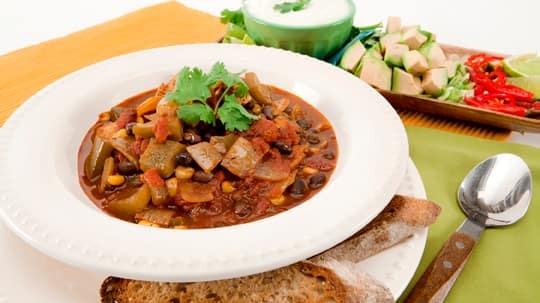 This lean and mean chili uses cubed boneless,skinless chicken breast instead of ground chicken. Not only is this quick and easy chili perfect for a family dinner, but it also makes for great leftovers for lunch the next day. Pack some separately with a whole wheat flour tortilla for your child to stuff and roll up into a chicken chili burrito. Trim any fat from chicken breasts; cut into 1-inch (2.5 cm) cubes. In large heavy saucepan, heat oil over medium-high heat; cook chicken for about 5 minutes or until no longer pink inside. Transfer to plate. Add onion, green pepper, chili powder, oregano, salt and pepper to pan; cook over medium heat, stirring often, for about 5 minutes or until vegetables are softened. Add tomatoes and beans; increase heat and boil, stirring often, for 10 minutes. Add corn. Return chicken to pan; heat through.